To her surprise, Korean nun Jeong Kwan has been a fan favorite and a revelation for professionals since sharing her style of temple cooking. Since her 2017 episode on Netflix' Chef's Table, the nun has been in demand around the world. She was in Honolulu recently to share both her ideas and her heartfelt cooking. Jeong Kwan lives in a Buddhist monastery in a national park outside Seoul. In 2017, only Jeong Kwan and one other nun were residing there, at Baekyangsa (Chunjinam Hermitage). A brief look at some of nun/chef Jeong Kwan's ideas. Jeong Kwan is a Seon Buddhist monk at the Baegyangsa temple in South Korea. The temple is located in Naejangsan National Park, three hours by train and taxi, or approximately a 4 hour bus ride from Seoul. Jeong Kwan cooks there for the only other inhabitant, a fellow nun, and for visitors who have begun arriving, of late, to taste her food. Jeong Kwan emphasized how plants are as different as people are. Some are seeded by birds or the wind, one might be nearer a puddle, another might be in partial shade, any number of factors affect the individual's life. The nun maintains, only by working intimately with each plant, can you know, really know, its essence. Only then, can you know when and how to prepare it. When Netflix asked her to appear on their highly rated Chef’s Table series introducing outstanding chefs from around the globe, Jeong Kwan said, No, she saw no point in it. However, once convinced it would be an opportunity to share both her food and Korean Buddhism, she agreed. Her 2017 Netflix episode was kind of a bombshell, with its radically different take on food. You could say it’s still being digested in elite culinary circles. Jeong Kwan was “discovered” by the renowned chef of Le Bernardin, and other eateries, Eric Ripert, who is a practicing Buddhist. He has brought her to New York to cook at his three Michelin starred restaurant, causing a major sensation. Read Ruth Reichel’s review of one repast. Diners extoll expecially, the mushrooms, cultivated on trees around the monastery, which might be aged, and served with aged soy sauce. 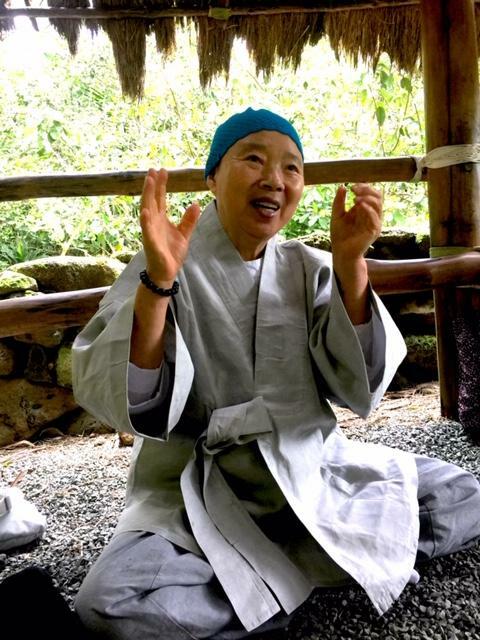 Jeong Kwan sunim, sunim, the honorific for a nun or monk, was brought to Honolulu recently by the Paul S. Honda Foundation. She offered a cooking demonstration to KCC culinary students and hosted gatherings for those interested in her work. 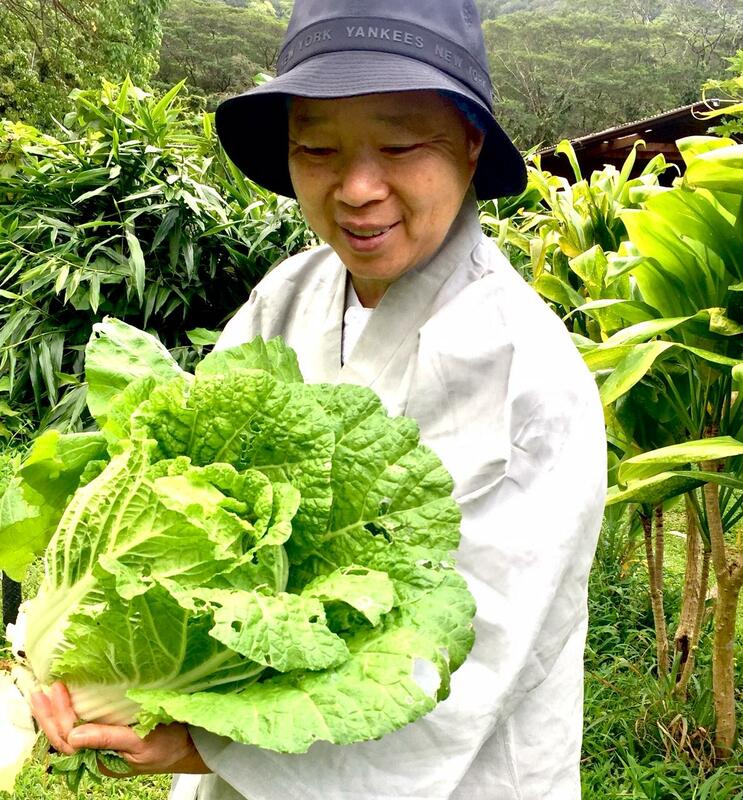 I was honored to meet Jeong Kwan at Chozenji Zen Dojo in Kalihi where she was staying, before heading a short way up the road to the farm she had chosen for our interview. Solid greens are the backdrop for Ho‘oulu ‘Āina, a 100 acre organic farm and community resource stewarded by Kōkua Kalihi Valley to help link people, food, and ‘āina. 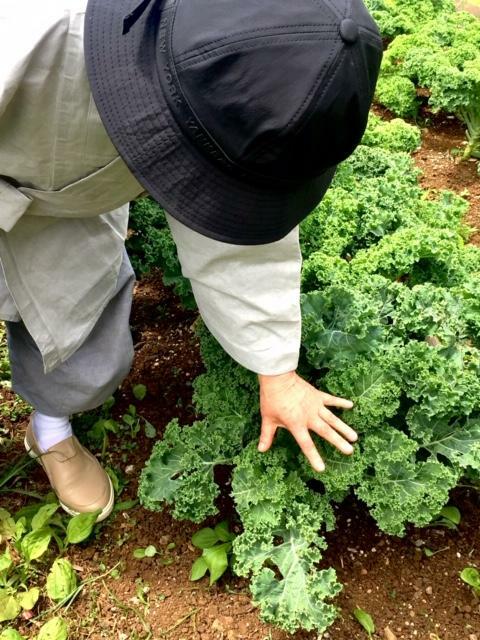 Here, with rows of lettuce, beans, zucchini, kale, papaya, taro, spinach virtually singing a chorus around us, Jeong Kwan, the now-famous Korean temple chef, looked at home. She’s travelling with Yoon Hee Kim, a tea and culinary educator who has worked with the nun/chef for many years. I asked about Jeong Kwan sunim’s response to this food, growing. Jeong Kwan: Just as individual human beings based on their backgrounds and influences they’ve been given in their lives, differ in many ways, so all the various produce are different and have their own individual characteristics. Even when you look at the kale here, the same type of produce growing in the same lot, the relationship it has to direct sunlight, and how close it is to the earth and whether they are close together, will differ and ultimately determine whether some grow very small or others flourish and grow much bigger, and so on. Even in the same lot, you have those that are on the ground that have been seeded by wind and rain and you have those that have been planted by human effort. They too are different. Jeong Kwan: So to truly understand, have a sense and feel for these items, one must give oneself, one’s energy, by working over a period of time, caring for it to truly understand the characteristics of each of these different plants that are here, and have a true feel for them, which you cannot get by just studying it. Daunting news, my urban compadres. Jeong Kwan: You’ve got the earth spirit, the sky spirit and so for. Even in this papaya tree, you have energy that runs through it. So when you talk about being in sync with the tides of the moon and such, you have to work the land to be able to truly understand, Ah, the leaves are good for consumption, to be able to differentiate what and how it should be appreciated and when. Jeong Kwan: That’s where the human knowledge and experience comes in to work in sync with nature, understanding how the cycles work. 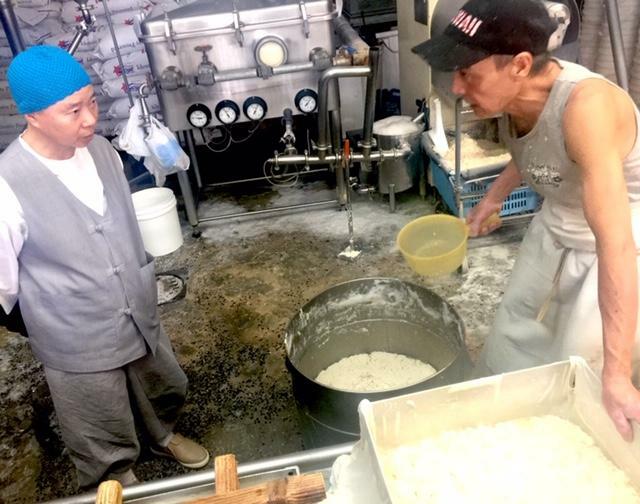 In the spirit of knowing your materials, Jeong Kwan wished to visit Mrs. Cheng's, a local organic tofu factory. Kim went on to explain that at temple stays, when the nun/chef talks about ingredients, the idea is not just to fill our physical bodies. She says, for someone who creates, the idea is to nourish in a holistic perspective. From that point of view, respect for each ingredient is the starting point. Kim says that respect is based on knowing where the products are from, understanding their essence, and recognizing them at their peak. This is crucial because these products are living beings. Kim: The way we give back is recognizing what they are, and being able, with respect, to highlight that ingredient as best as it can. It will then give its best energy to us. It’s the combination of recognizing, respecting the ingredients, and putting your whole energy into it. You are then giving it energy, and it will then give energy to all that consume it, both body and spirit. Way back in the valley, there’s the freeway noise, I know, but it’s also as if the plants are humming! Casey, our kind and generous guide at Ho‘oulu ‘ Āina, filled our arms with a giant won bok, daikon, and tī leaves which Jeong Kwan Sunim would use to wrap rice for a dish in the coming days. Dressed in a simple, light grey tunic and loose grey pants, nicely pressed, the rather tiny nun surveyed the vegetation practically screaming all around us. You could almost hear their eager reports about living there in Kalihi, drinking in the rain, swelling up with the sunshine, which was now emerging from behind a cloud. 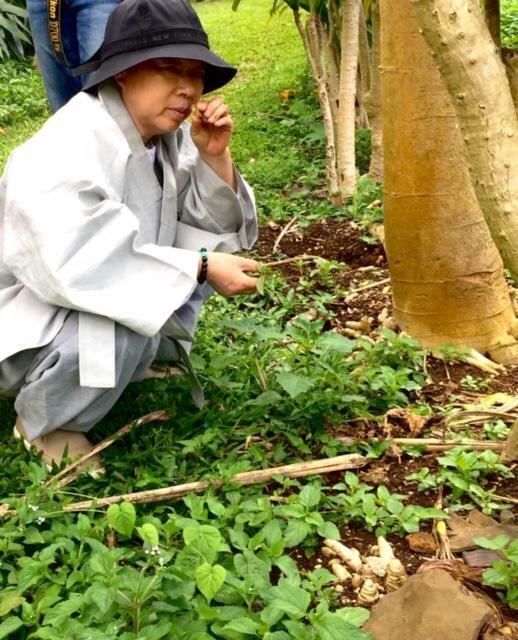 Jeong Kwan sunim bent down near a papaya tree. Jeong Kwan: It’s all about being one. Unity, the cycles of regeneration, birth, death, rebirth, and so on and so forth. 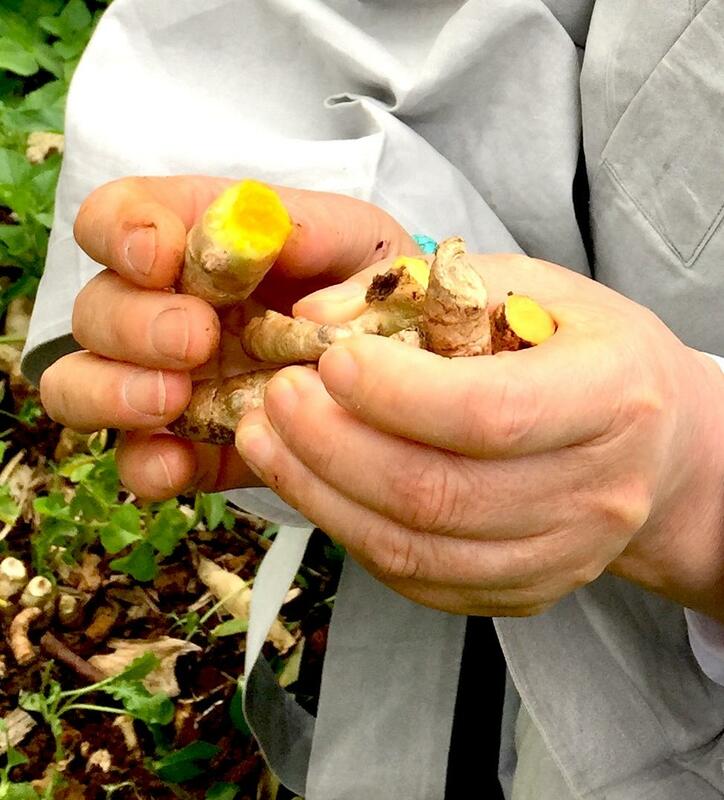 When you look at the turmeric, the self, the field, the ‘ahu, they can’t be in separation unto themselves. You can’t think of them in individual form, they have to be thought of in a holistic manner. Jeong Kwan: Only when it is all one, birth, death, rebirth, death, rebirth, the cycle, continuum, to be one, whole, in unity, nature, ingredients and human beings. Only when that is a whole, are we all one. How do we preserve or even contribute to the energy already in food? Jeong Kwan: Part of the key there is meditation. Food was originally thought of as medicine. Food is a vehicle through which we walk towards our own self discovery, towards enlightenment. If that is the case, the mechanism to help facilitate that, especially in the philosophy of Buddhism, is through contiguous meditation. Jeong Kwan: So meditate. A daily practice. It doesn’t have to be long, it doesn’t have to be formal, but daily practice of meditation helps us to be able to understand and consume the food as a way of nourishing both our body in the physical form and our spirit and our soul. 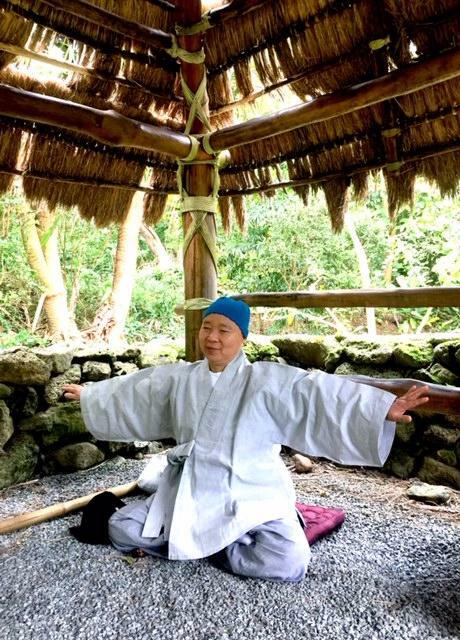 Jeong Kwan: Only when one is open can you in fact absorb the energies from all various sources, all various sources. And be able to create something that is uniquely your own. Jeong Kwan says, I’m a meditator not a professional chef. Principles and practices of Korean temple food are attracting international interest. There are many articles and videos online, and various sites have information on visiting Baegyangsa temple, which costs 3000 won to enter. There is also an overnight temple stay, including temple food with Jeong Kwan. More on Korean temple food. Is "Local Food" on the Way Out? Poke, chicken long rice, lū‘au stew, pork katsu, ox tail soup---we all know what local food is, and we’re watching it evolve. Changing demographics, food media, and travel are introducing new formats and flavors even as we continue to flock to our favorites. HPR’s Noe Tanigawa reports.